About She is just Srna as she is, she wrote me, as her pictures are also just the heart and courage of Srna. She celebrated her Birthday last weekend. I hope you had a happy day dear Srna with friendly visitors from UF, with your dearest friends and relatives. I had liked to send you flowers, but at Sunday here in Europe nobody wanted to work and deliver. So I looked elsewhere. 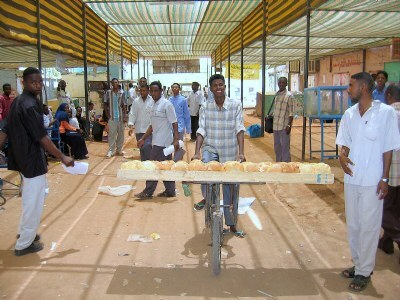 I ordered you instead a delicious breakfast from Khartoum, where the work week just started. I hope that this delivery will reach you soon. Without too narrow roads :-). It started hot from the oven and will reach you just at perfect temperature after a while. I will ask Biljana, living such close to your home to bring you some fruity marmalade with a spank of sunshine to top it off. I'm still trying to find you a typical tea lady pouring in the cups. This tea should be served very "hot" and has to remind you to the sound of breakers on the beach, the sound you love so much. Enjoy it all dear Srna with your best taste for lighting, composition, POV, DOF and most of all : plenty of smiling and colours in your life!! You are so very sweet and kind my dear Paul - Your very nice comment is so flattering to me - I am so happy you are having FUN !!!! Yes dear Paul and I do still appreciate the delivery from Khartoum. Less coffee is not a bad habit at all ... wishing you fantastic time !!! My dear Michele, how I understand and learned from you the balance between UF and other activities. And understand my life as well riding on a bike in Paris myself, work and some sight seeing with my present guests from Sudan take most of my time. You are welcome Mojgan. It was a pleasure to surprise Srna. My kindly thank You once more dear Paul. Just stay as you are, you are so very fine person ! Congrats once more dear Srna, I would bring you another fresh breakfast tomorrow if you like. It doesn't matter so much that it is not your Birthday. et une tasse de cafe de moi pour Srna ! Hahahaha....a very UNIQUE and a very great image.What an original idea for transportation bread and to make this shot as dedication to our dear Srna!! I like to see all the men who are looking very amused about your cam..LOL!! !The young man on the bicycle looks very happy too!Great composition and presentation!! I wish you a happy evening and big hugs to both of you!!! everybodies' eyes was on the cam!! very well composed, interesting frame!! Un'idea molto originale, intelligente e bellissima. My so very heartfelt thank you dear Paul on such an original and beautiful B-Day Gift and wishes, really enjoyed in every single detail my kind and dear Friend !!! Bravo Paul it's really very very special birthday gift for our dear Srna!! Bonsoir Aykaan, ton image n'était pas si mal et la belle mais sévère fille est pour toujours grevé sur la rétine. Pourquoi as-tu enlevée cette impressionnante image ? une belle et instructive image de la vie quotidienne.. très bon travail..